The body of this stein is a smooth, white and blue glazed, high quality stoneware decorated with a gold wrap around design. 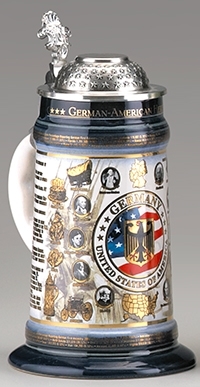 Along the top border of the stein are the words, "GERMAN-AMERICAN HERITAGE.” The left side of the gold design features a timeline detailing significant events in the history and accomplishments of German-Americans, beginning with the year 1608 when Germans arrive in the English settlement of Jamestown, VA. 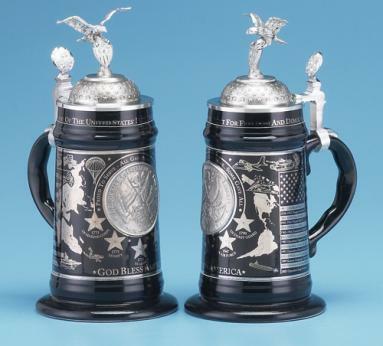 Images of popular American traditions adopted from their German heritage and famous German-Americans adorn the left side as well. 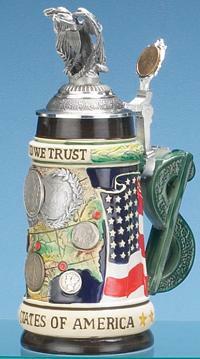 The right side of the stein features additional images of famous German-Americans and aspects of American culture adopted from its German heritage. The timeline from the left side continues on the right, beginning with events in 1856 and ending with the 2000 census results revealing that 15% of the American population are of German descent. 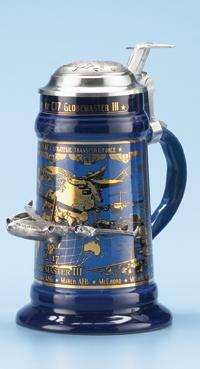 At the center of the decoration is a German Eagle crest design against a U.S. Flag background. Encircling the design are the words, "GERMANY” and "UNITED STATES OF AMERICA,” and above and below are maps of both countries. Rows of raised stars decorate the ornamental pewter lid. 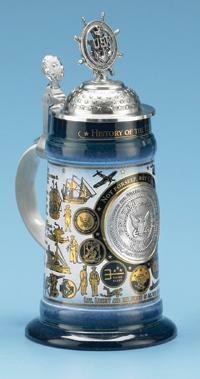 This version of the German-American Heritage Stein is produced in a registered and individually numbered series of 5,000 pieces.